The sixth release on Greek label Vanila offers a hefty dose of wild rituals from Morah’s distorted mind. With sluggish but hammering percussion, Greek madman delivers a rhythmic noise masterclass with plenty of obscured vocal samples. Unless you are in favour of ultra-slow versions, the vinyl has to be played at 45 RPM and even then it tends to insist a higher pitch. The tempo is actually a secondary issue because of vast amount of roughness found in the record. The A-side’s “Arpyies” is about savage, chugging rhythm and abnormal moaning from the mouth of creatures on GMO diet and its twin “Sirines” adds a looney vocal passage. In “Kires” a mean, metallic synth riff is coupled with neurotic yells and articulations before “Erinies” gives the floor to wicked one-eyed drummer for the finale. An uncomfy record that sounds like Black Merlin, Interstellar Funk, Harmonious Thelonious, Kareem put in the same pot. 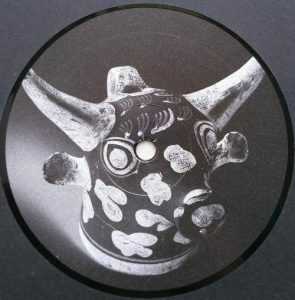 Morah’s previous affiliations with labels such as Return To Disorder, Berceuse Heroique or Lux Rec explain well high sickness grade of this EP.